Copyright resides with the original holder (probably Willoughby Gullachsen), no reproduction without permission. ‘Bad Company’ was a two part drama based on the 1978 Carl Bridgewater murder case. 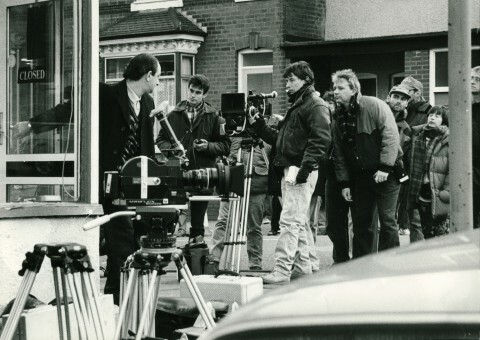 The two parter was a dramatisation of the investigation into the murder of the 13 year old paper boy; the police case resulted in the conviction of four men in 1979. It was directed by David Drury, written by Don Shaw and produced at Pebble Mill by Chris Parr. The photo includes (L to R) Ken Stott, Noel Paley, ? (focus puller), John Greening (1st AD), Paul Gooch, Lesley Thomas (wardrobe), Chris Parr (producer) (behind post). Other cast – George Irving, Jonnie Lee Miller, Susan Wooldridge, Brian McGrath, Mark Drewry.